Kelly Velasquez is our Associate Director of Credentialing - Research & Quality Management. (Believe it or not, Kelly is not even in the running for the longest job title in the office.) Kelly has been a big supporter of our wellness efforts and is a long standing member of our wellness advisory team. Kelly is a swimmer and a triathlete. She is married to Eduardo who also works for ASHA and has two beautiful little girls. As you can imagine, what she doesn't have is spare time. Yet she logged more activity points during our Backfield in Motion Campaign than just about anyone else on staff, so I asked her to share some of her tips with us. It’s finally Spring, and with warmer weather come thoughts of outdoor activities, cook-outs, bathing suit season, and a chance to get off the treadmill, elliptical, stationery bike, or desk chair and get outside. Not that I think you should jump right into a 10K race if you have never run before, though if that is your thing, go for it. Most fitness experts do think that setting a large goal (e.g., triathlon, 5K, obstacle race, cycling event, etc), and including many smaller, achievable goals along the way (e.g., swam 10 laps without stopping or drowning, took bike into store for tune-up, walked for 15 minutes, etc) is more likely to lead to success than just trying to start working out more. Set your phone/PC/clock alarm for a pre-determined time(s) and get up to walk to the water cooler to re-fill your cup/bottle…but go the water station two floors below or above you (walking, no elevator!). Meet a work pal for a 15 minute break and do a few sets (walking one, high knees on next, or every other step) of the back stairs in our building – from B-1 to fifth floor. Schedule mini-workouts as you would meetings – you only need 15 minutes, and can break-up your day by scheduling one 15 minute workout break mid-morning and one mid-afternoon, when the post-lunch sleepies hit. Use a pyramid-like plan – do 1 push-up (strength move), 1 jumping jack (cardio), and 1 sit-up/ab move; then add one of each every day to work your way up to 30 of each. Plan your weekends around what activities or more structured workouts you’ll be doing – and then do them. When shopping for groceries, park your cart in one location/part of the store, and make numerous trips to get your needed items and bring them back to your cart. Feeling guilty taking time away from work/family/friends to work out? Try incorporating activity into family events, friend get-togethers, or work. On Sunday, for instance, we went to the National Zoo with the kids, and met our friend and fellow ASHA staffer Tammy there. Little did I know the workout that Tammy and I would get with all of the walking, carrying, stroller-pushing, lifting two 30+ pound children so they could see over various enclosure fences (or because they were scared that the orangutan would charge at them). We were all exhausted after 3 hours, and a side bonus was the long naps the kids took afterwards. Or, meet a friend for a walk or run or hike, and catch up on news while you work-out. Another favorite of mine is to take a mini-break from your desk and go for a walk around the block, or walk to the Mediterranean Café to pick-up lunch. Now that the weather is finally nice, it is easy to find excuses to get outside. 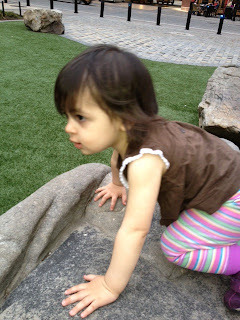 We love taking the kids to the Rockville Town Square and letting them run around on the grassy field area and climb the rocks, then grab a bite at one of the family-friendly restaurants in that area. Makes for a great start to the weekend, and I don’t have to cook dinner on a Friday – win/win! 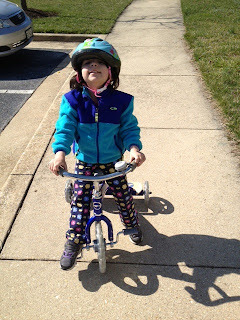 And we can’t wait to do family bike rides, though those may be quite a few years away yet – we did get our eldest daughter (who is now 3) out on a hand-me-down tricycle for the first time last weekend, and she loved it. Finally, find an activity you love to do, and then incorporate it into your daily activities. I am not a dancer, but my girls love to rock out to any kind of music, so I’ll dance/hop up and down with them, and burn more calories in 10 minutes of energetic dancing then an hour of formal, structured ‘cardio.’ Be open to the possibilities, and try something new once; it’s definitely better if you can convince or coerce a pal to try it with you; but getting out of your comfort zone is often just what is needed to get moving more! My kids love the treasure hunts; it’s like having Easter every day!